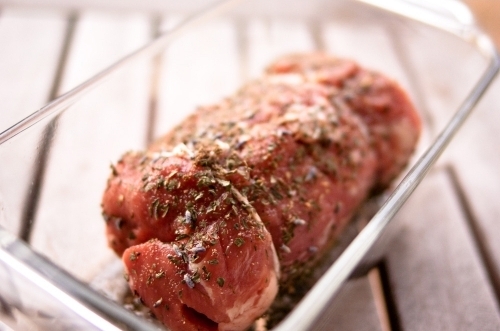 Wondering how long to cook pork tenderloin? Pork can be a bit intimidating simply because it has to be cooked through all the way to avoid serious bacteria. Pork tenderloin is very easy to cook and has many health benefits. Pork tenderloin is one of the leanest cuts of pork and contains many vitamins such as vitamin B6, B12, riboflavin and niacin. Here is an easy recipe for pork tenderloin. 2. Mix bread crumbs and olive oil into a bowl and mix until it gets a sticky consistency. 3. Place pork on baking sheet and cover with bread crumb mix on both sides. 4. Cook for 35 minutes. Pork should not be pink when cut. This meal is best served with a nice lemonade or other fruit drink. It compliments the pork tenderloin and cleanses the pallet.